This pressure washer is built in the USA by Pressure Pro. 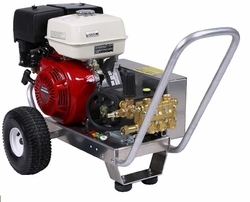 It delivers 4000 PSI and 4 GPM with a smooth belt-drive system. It features a General Pump, a GX390 Honda engine, and an aircraft-grade aluminum frame with a lifetime warranty. It has an adjustable unloader, pneumatic tires, and a low-oil shutdown. This machine comes complete with gun/wand assembly, 50' high pressure hose,chemical injector, QC nozzles. This machine is designed to deliver years of excellent service with regular maintenance. Available as a portable or as a skid-mount model for the same price!